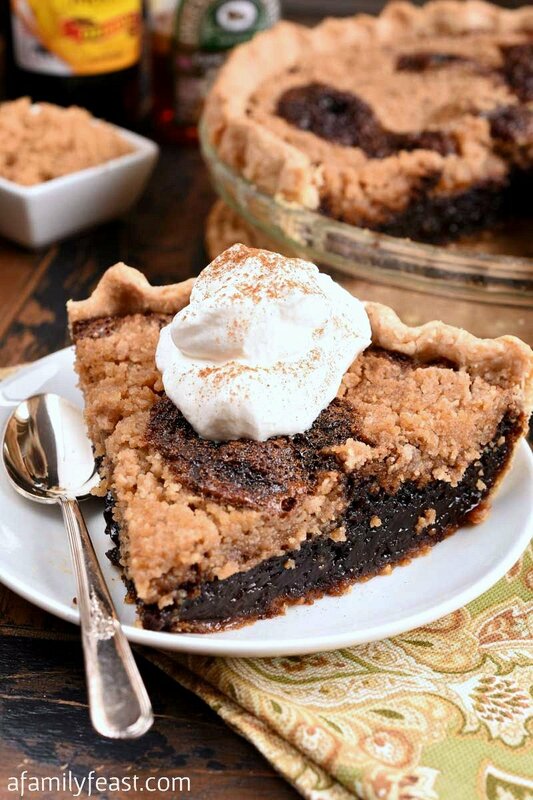 Shoo Fly Pie is a vintage molasses pie recipe that is absolutely delicious! A very nice gentleman who follows us on our Facebook page told us about the song – and believe it or not – that was the inspiration to share this recipe for Shoo Fly Pie today! We had just shared our Apple Pandowdy recipe, and that man left a comment with the lyrics to the song along with a request for a Shoo Fly Pie recipe. I have to admit, I had never heard of or tried Shoo Fly Pie – so I immediately looked up the song and started researching recipes. I’m so glad he made the suggestion – Shoo Fly Pie is incredible! It’s a simple deep-dish pie with a filling made with molasses, brown sugar, and eggs. Plus, we added Lyle’s Golden Syrup – which really helps mellow the sometimes-bitter molasses although it isn’t a totally traditional ingredient. Before baking, a cinnamon and nutmeg infused crumb topping is sprinkled on top. As your Shoo Fly Pie bakes, the filling bubbles up and thickens into a wonderful, rich almost cake-like custard that is similar in texture to a pecan pie without the nuts, and tastes (I think) like sweet, mellow raisins (although there are no raisins in this recipe!). This is a truly wonderful pie, and I can totally see why it inspired a song. This pie also has an interesting history. It dates back to at least the 1870’s, and the Pennsylvania Dutch are credited with its creation. Even today – in Lancaster County, Pennsylvania – you will find it on the menu at many local restaurants. Depending on which historian you believe, the name comes from having to “shoo” the flies away to prevent them from landing on the molasses pie after it was baked. Or, it came from a popular molasses brand called Shoofly Molasses – which was named after Shoofly the Boxing Mule, a very popular circus animal in 10th century Pennsylvania. I should also note that there are two variations of Shoo Fly Pie – ‘dry bottomed’ which is baked in a pie crust and yields a firmer texture, or ‘wet bottomed’ which has a crumb crust and yields a softer, custard-like consistency. Our recipe today is a dry-bottomed Shoo Fly Pie. *Please do not use a pre-made refrigerated or frozen pie crust. This pie needs high sides and the store-bought crusts are just not high enough. Also use a 9.5 to 10-inch deep-dish pie plate. To make the crust*, cut the butter into pats and place flat on a plate. Place the plate in the freezer while you prepare the remaining ingredients. In the bowl of a food processor, place flour, salt and sugar and pulse to combine. Add cold shortening and pulse a few times. Add frozen butter and pulse until the butter is pea-sized. Pulse while adding cold water, stop and check by pinching some dough and if it is crumbly, add a tablespoon of water at a time until the dough comes together. Pour out onto a floured counter and press together into a disc. Wrap tightly with plastic wrap and refrigerate 30 minutes. Remove dough and on a floured surface, roll dough so that it is two inches larger than your 10” pie plate. Place the dough over the pie plate and gently press in and up and over the edges. With a knife or scissors, cut extra. Pinch the overhanging dough into a high ridge all around and then go back over and a make decorative edge, again, keeping it high. (I use thumb and index finger on one side and the knuckle of my index finger on the opposite side and press together to make a scalloped edge) Note that the filling is liquid and will leak through if your dough has any rips or punctures so make sure it is solid. Place the completed pie dough in the freezer for 30 minutes to set up so that the sides don’t collapse while baking. Preheat oven to 375 degrees and once the pie plate with the dough sits in the freezer for 30 minutes, remove, add parchment and either pie weights or dry beans, fold parchment to fit up sides and fill to the top with the pie weights. (To make the parchment fit, cut parchment into a circle larger than the pie plate and make four slits a few inches long around the edge half way to center so when you place it in the shell, it overlaps and fits up the sides.) Place in the oven for 15 minutes. Remove pie weights or beans. The shell is now ready to be filled. While the shell is being prepared, make the filling by placing molasses, golden syrup, brown sugar, vanilla and beaten eggs into a large bowl. Whisk until well combined. Boil the water and measure out one cup into a 2-cup measuring cup. Add baking soda and stir. It will bubble up a bit which is why you need a 2-cup measure. While whisking the molasses mixture, add the hot water slowly until all in and whisk to combine. Set aside for now. In the bowl of a food processor, add flour, sugar, cinnamon, nutmeg and salt and pulse to combine. Add cold butter and pulse a few times until butter is pea sized. Pour the molasses mixture into the prebaked pie shell and sprinkle the dry topping all over the top, right up to the edges. Some of it will sink which is fine. Place in oven for ten minutes then reduce temperature to 350 degrees F. Bake for 35 minutes or until set. To check, give it a little jiggle and if it is not finished baking, the center will still be liquid. Allow the pie to sit for ten minutes before serving warm, or chill and serve cold. Whip heavy cream and serve a dollop with the pie if desired. Sprinkle cinnamon on top too if you’d like. SHOO fly pie is traditionally NEVER served with whipped cream! I have my family recipe, handed down from two generations before me by my German maternal side. Also, it is very unnecessary to freeze the crust, weight down with brans before baking, etc. Thank you for your feedback Linda!